BugDoc Dave here with today’s Stretch Tuesday. I feel like another session on stretch candleholders is in order, especially after seeing the great “Colonial” ones shown in Roger’s introduction last night! I spotted mainly Northwood (because of the ball connecter where the stem meets the base) in Blue, Russet and marigold. 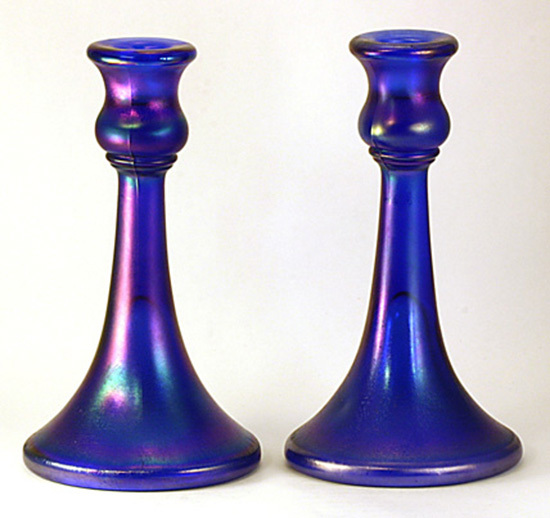 Tonight I want to cover some other confusing pieces, what we stretch collectors collectively call the “trumpet” shaped candleholders. In general, these pieces have the candle cup at the top, then the stem gradually flares out like the end of a trumpet. The most confusing ones are the 6-7 inch tall ones made by Central, Northwood and Vineland. Central’s candleholder is the tallest, usually being at 7 1/4-inch in height. The very similar Northwood one is in the 6 1/2-inch range. 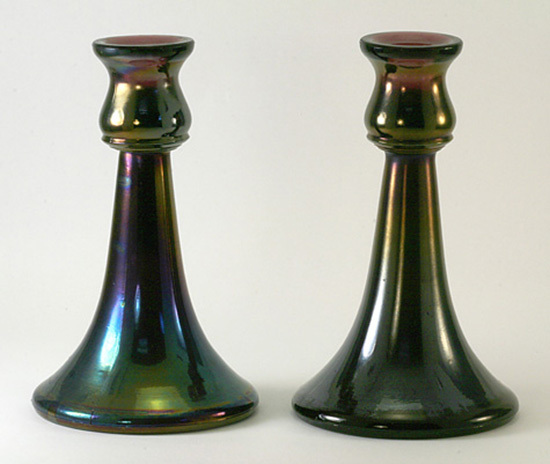 Both have two rings where the candle cup joins the stem, but the candle cup of Central is tall and the Northwood one is short. 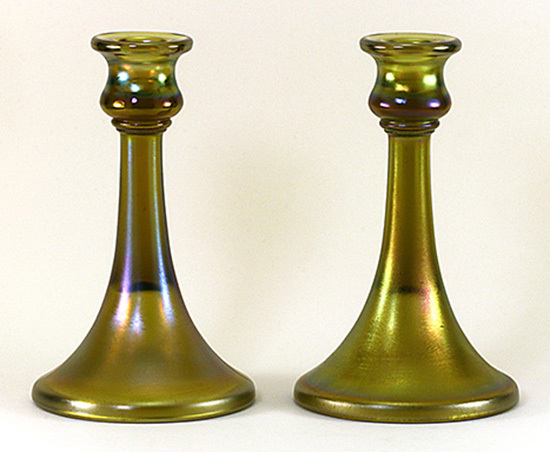 The Vineland candleholders are actually the easiest to identify because there are three rings at the candle cup-stem junction. 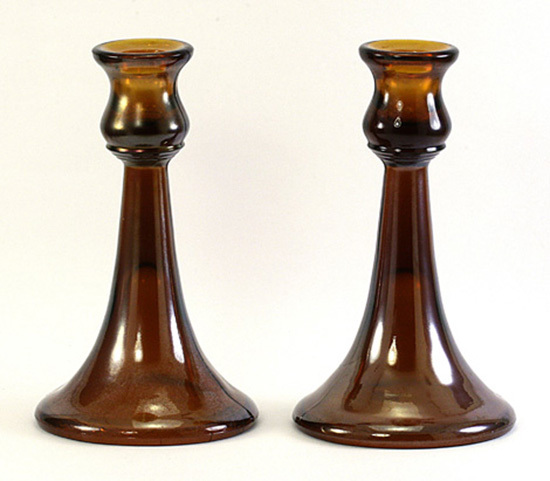 The Vineland candleholders are kind of intermediate in size, being 6 3/4 to 7-inches tall. An added extra wrinkle is that the Vineland holders come in a thin-stemmed and thick-stemmed version. 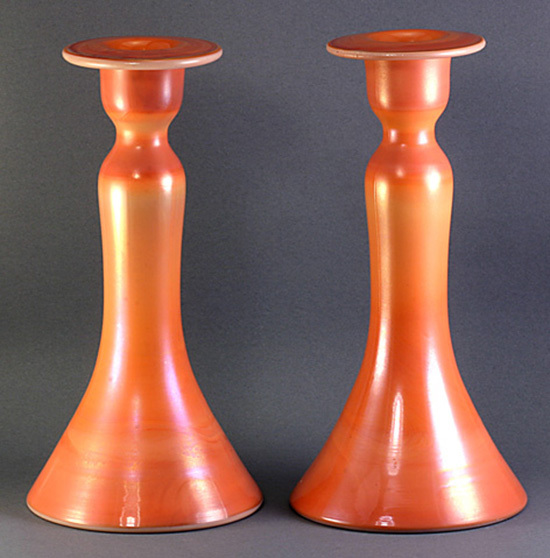 I personally think that the factory had to recondition the candleholder mold, and this made the mold slightly larger. 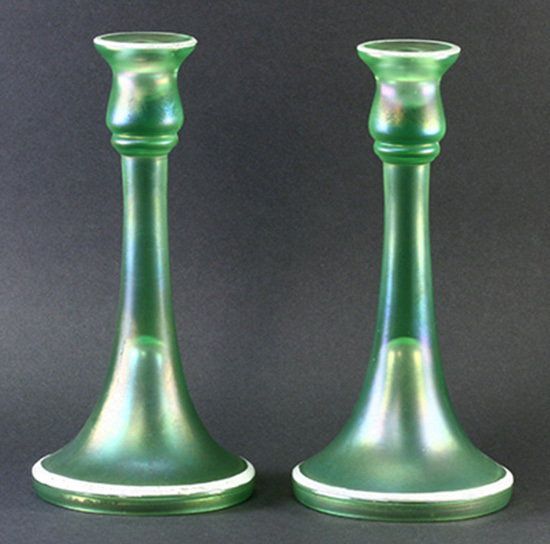 Of course, Northwood made another trumpet-shaped holder, but this one has a swirl rib pattern on the stem and base. 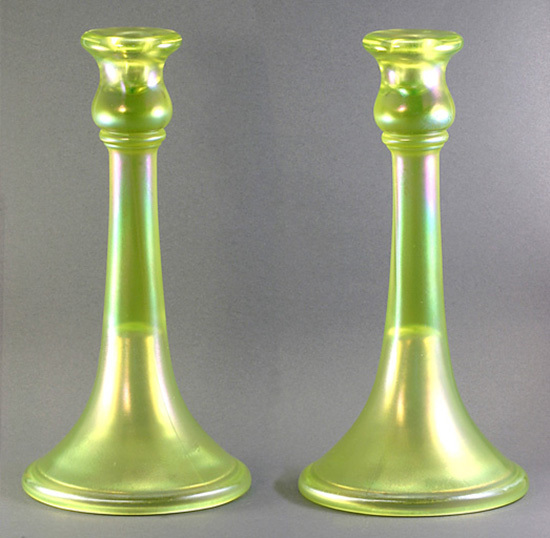 Central also made a 9-inch tall, trumpet candleholder. This one is virtually identical to one made by Diamond! When you compare these two holders, the most obvious difference is the base. The Central holder is rounded while the Diamond holder has a straight side. The single rounded ring under the candle cup looks the same unless you look closely. The Central set has a cove (going in) band under the ring while the Diamond ones are rounded out. 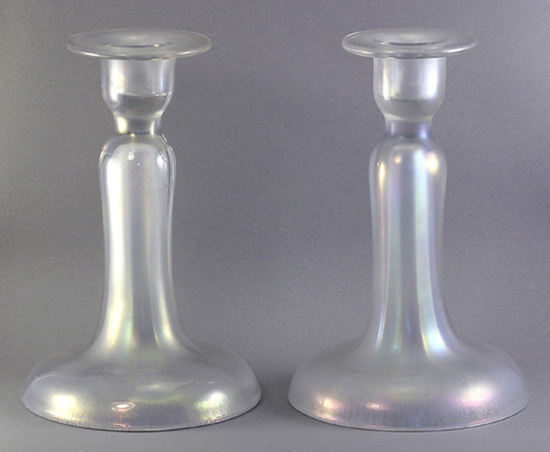 Diamond also made another trumpet-shaped candleholder that is about 8-inches tall, but this one has the candle-cup only slightly flared out and smoothly joins to the stem. 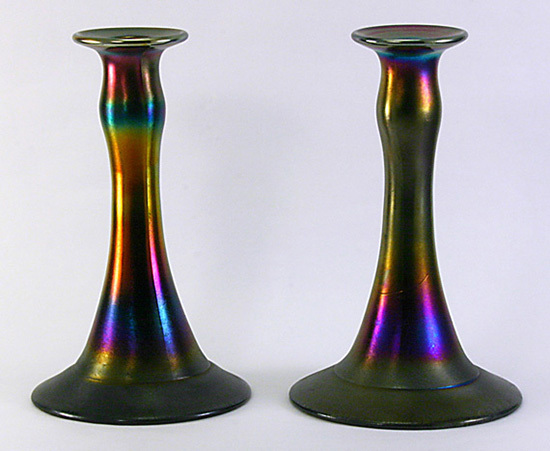 The base of this candleholder is nicely flared out, thin, and there is a definite seam about an inch up from the bottom. Where there are other companies that made a similar holder, Diamond is the only one to iridize this form. 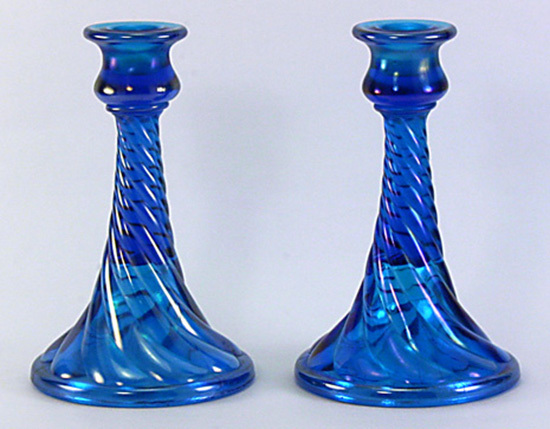 And, the U.S. Glass #151 candleholders can have a nice trumpet shape or the base can be flared out and cupped in. The true trumpet-shaped ones are about 8 3/4-inch tall and the candle cup is separated from the stem by a constriction. 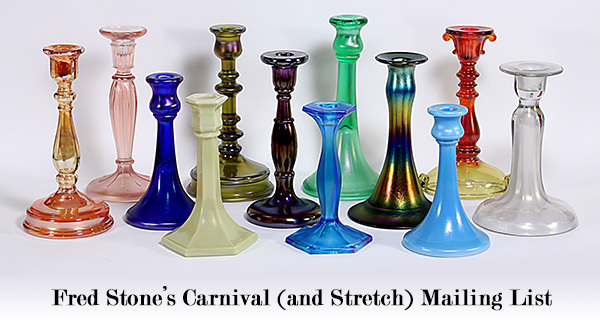 As you can probably guess, most of the candleholders can be found in the common colors made by each of the companies, so trying to assemble a “complete” collection could be a daunting (and expensive) proposition! But, that’s the fun of collecting iridized glass!